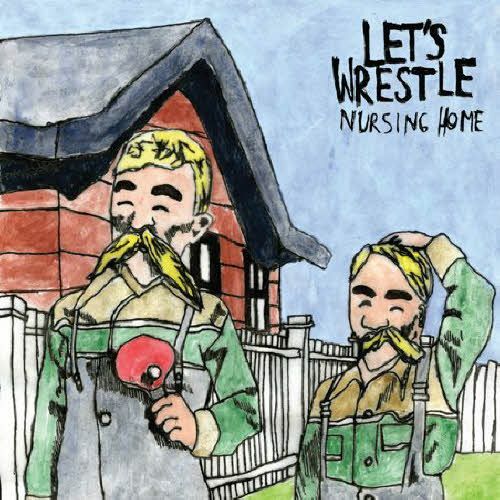 Let’s Wrestle – Nursing Home | "I Prefer Their Old Stuff"
There is something strangely charming about Let’s Wrestle, something quintessentially English in their style and lyrical delivery. Who else could produce songs about going to the library and the charity shop, or boiling the kettle and forgetting to make the tea as they did on “My Schedule” from their debut of 2009, “In The Court of the Wrestling Let’s” (itself a witty play on the title of the famous King Crimson album)? They continue this on their follow up “Nursing Home”, albeit with a bit more urge and vigour than last time, maybe something to do with a certain legendary Steve Albini at the controls! Although humour plays a large part in their music they are not and are not trying to be a ‘comedy band’ but rather use their sarcasm and wit to elicit smiles rather than belly laughs, none more so than on track “Bad Mammaries” where the band seem to be admonishing a forty something woman for flirting and flaunting her assets “and please just give up, join a nunnery / cos you’re past your sell by date / and please stop flaunting your mammarieeeess”! Despite all this they also manage to carry off “For My Mother”, a surprisingly tender but non-schmaltzy dedication, which amongst the sharp-tongued witticisms of the rest of the album is a pretty neat trick! Throughout this joyful little half hour album they have really stepped up the pace and have a bit more of a pop punk feeling than the more slacker lo-fi of their first album, none of the songs here go far past the three minute mark meaning that the album never outstays its welcome. So much for the ‘difficult second album’, to me this second outing proves that the band still have a lot of good stuff left in them. Another cracker that will no doubt find itself on these very pages come end of year list time. This entry was posted on May 22, 2011, 1:43 pm and is filed under Music Reviews. You can follow any responses to this entry through RSS 2.0. You can leave a response, or trackback from your own site. May Musical Highlights « "I Prefer Their Old Stuff"
The IPTOS 50 Best Albums of 2011 – Part One, The First Twenty « "I Prefer Their Old Stuff"